I am a Gen Xer. I was born right at the tail end of a generation that rallied around pop culture, that ushered in the internet, that saw the rise of women taking on the workplace with their shoulder padded power suits and big hair. We were told that we needed educations so that we wouldn’t have to rely on a man. We were taught that women are just as good–actually, better–than men, and that we should have no mercy in our attempts to steamroll right over them, whether in the workplace or in the home. We were given the charge to stand in the spotlight as much as possible, to grab for ourselves as much as we wanted, and to not let anything stand in the way of our happiness. 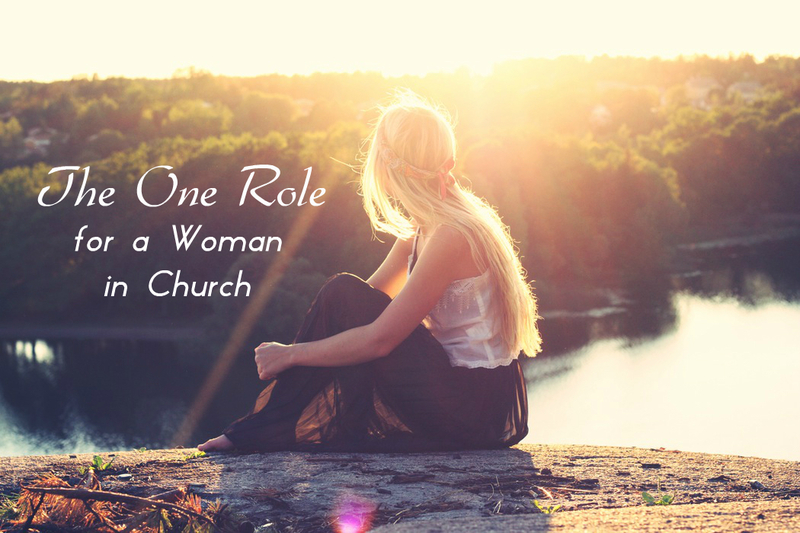 Yet, my whole life I’ve sat through countless discussions on women in Christianity, namely in church life, and for all these years I’ve listened with a smiling face and a tightly clenched jaw. Everything in my culturally conditioned mind said that women should be competing with men for the highest leadership roles in the church. In my foolishness I wondered why men were allowed to be center stage while the women were relegated to nursery duty. And, if you want to be really honest with yourself, women, you have probably felt the same way at some point. Recently I went to a panel discussion on setting women free to be whatever they can be in the church. I know that the hosts of this discussion had noble intentions from the outset. The session title implied that women have been held back in the church, and the hosts seemed keen on starting a discussion about how to change that. I was amazed by how many hundreds of women (and a few brave men) packed themselves into the room, eager to get any biblical wisdom about what women should and shouldn’t be doing in our local churches. Yet, when the panel began, it was really just a forum for voicing complaints and talking about how we feel about our roles in the church. No real solutions were offered. No practical advice. The language was about how it’s our turn to shine, about how we ought to be on the platform and in the spotlight, about how husbands feel threatened by strong women, and so on. At one point the moderator opened the floor for questions, but added the caveat that she didn’t want to get into “picking apart scripture” because, she admitted, she was scared to do that. As I sat there, I had a bit of a revelation. It dawned on me that here we were, a room filled with hundreds of women, honestly trying to figure out how to better elevate and glorify ourselves in the church. Not only that, but in the process of trying to figure out how to get what we must feel we deserve out of the Christian faith–prestige, honor, respect–we were driving the men in the room to feel shame for fulfilling their God-given roles in the Body. We were even denigrating the extremely crucial and very real calling that many of us have to work with children and babies in our churches. I don’t believe this is what the panelists intended to happen in the course of the discussion, but it happened nonetheless. And, when the conversation was stopped short at “let’s not get into scripture,” the whole framework of the session just lost all meaning. I felt so much conviction, sitting there on the second row, empty page where all of my notes from this discussion were meant to go, realizing that at the heart of this clench-jawed worldly wisdom sat me, on a mission for my own glory. More worried about making sure that I am lifted up than about making sure that Jesus’ name is carried to the nations. We women are such a complicated and sensitive lot. We want so much. How can we, at the same time, want God to be glorified to the utmost and yet also want to make sure that we get the honor and recognition we feel we are due? So, we smile and say that God deserves all and we are nothing, but we clench our teeth and we maneuver for position and appreciation and a spot on the platform. What if, instead of obsessing over our place in the church, we simply set out to humble ourselves as much as possible? What if, dear sisters in our Lord Jesus, we opened clenched fists and opened our arms to those who need us, ministering in the beautiful, glorious ways that God has gifted us to minister? What if we spoke when we should and we were quiet when silence will bring Him the most glory? What if we stopped making church a battle of wills and started making it the fulfilling of His will alone? What might He do in us if we gave in to the truth that we are all, even ferocious and powerful women, just weak and poor and lowly before a holy God? I think He could really work with that. In Luke, Jesus tells a parable about a wedding feast. A guest arrives and sits himself right down in the seat of honor at the table. Imagine the embarrassment for the whole assembly when his host comes and asks him to move so that the guest of honor can have his rightful place. We don’t want to be the wedding guest who is trying to be a big shot. Don’t do it, friends. Let’s sit on the floor. Let’s do the hard work. Let’s serve the least of these. Let’s show ourselves faithful in what God has given us to do. And, if God calls us to stand on platforms, let us do it with the reality in mind that He is the only one worthy of honor, and we are shaming ourselves and His name when we try to steal His glory. Wonderful women of the Christian faith, let’s stop trying to exalt ourselves. We don’t need titles and spotlights in order to live our lives on mission for Christ. When His fame and His glory are our only concerns, the debate about our role in the church becomes moot. We all have the same role, whether we’re washing dishes or speaking to tens of thousands: glorifying God with every breath. Breathe deep. And trust that He will bless.